Group size is six guests plus two guides. Our trips begin in Sandspit, British Columbia. Guests are picked up in the morning at Seaport B&B (or another Sandspit accommodation of your choice) for the one-hour van ride to Moresby Camp. 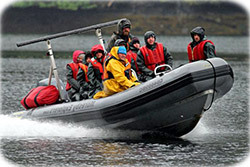 Here, you board a large Zodiac-style speedboat for transport to the southern tip of the archipelago. 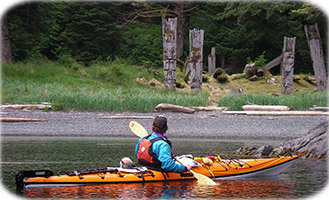 Around midday, you arrive at the tiny, isolated community of Rose Harbour to begin your kayak exploration. The Waters of SGang Gwaay trip takes you to a number of rarely visited remote beaches, some with exposure to the open Pacific, making them a beachcomber's dream. The rugged outer coast consists of jutting headlands and sheltered bays, as well as the exquisite Gordon Islands cluster. Humpback whales, steller sea lions and horned puffins thrive in this rich and diverse marine environment. For details, see the route map. 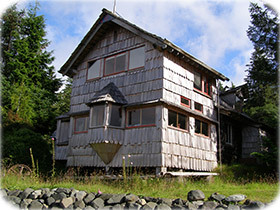 Visit the ancient Haida village of Ninstints on Anthony Island. This extraordinary historical settlement is a United Nations World Heritage Site, also known as SGang Gwaay. Numerous totem poles overlook the village and longhouse ruins are still visibly prominent. Haida Watchmen working at the site can explain the carvings on the poles and provide insightful interpretations of the village and their ancestors who once lived there. Spend a day exploring the island and experiencing the sense of mystery that lingers in this ancient village. During the trip, we paddle throughout the waters surrounding SGang Gwaay. This region is truly a kayaker's paradise, with countless inlets, coves, beaches and islands to explore. 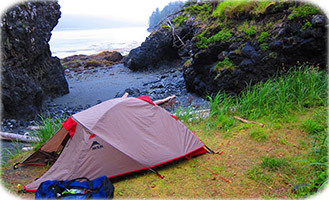 We camp on soft, thick moss amongst the giant old-growth cedar, spruce and hemlock that flourish in the lush temperate rainforests of Gwaii Haanas. We generally paddle to a new campsite each day the weather and sea conditions allow us to. After enjoying several days of paddling and camping in this truly wild region of the coast, we return to Rose Harbour on the second-to-last day. Here, we indulge in wood-fired hot showers and dinner hosted by the local residents. These fascinating homesteaders are happy to provide a glimpse into their unique self-sufficient lifestyles. Our last night is spent in the fabulous Rose Harbour Guest House; a lovely, rustic accommodation carefully hand-built by resident musician Götz Hanisch. The speedboat arrives in Rose Harbour to transport the group to Sandspit. Depending on conditions, the boat may pass through Burnaby Narrows. At the end of the day, you are returned to Seaport B&B, or another Sandspit accommodation of your choice. The Waters of SGang Gwaay tour is suitable for relatively inexperienced paddlers, as well as accomplished kayakers. Even with skilled kayakers, we ask each group member to cooperate with our professional risk management guidelines. 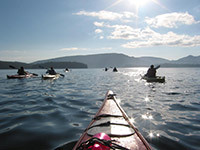 Our groups remain with the guides when on the water; there are very limited opportunities to paddle without the guides. Those who may not appreciate this style of group-oriented risk management are encouraged to consider a self-guided trip. Prospective tour guests are encouraged to complete the Butterfly way questionnaire before registering. 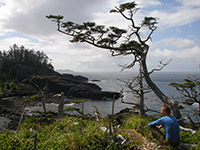 Routes and itineraries remain very flexible to accommodate changeable west coast conditions. Alternate boat or floatplane transport may be substituted. In order to confirm this trip, two people must register in advance.